We’d love your help. 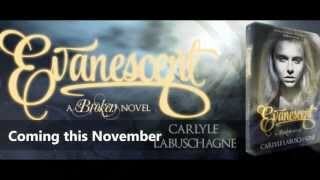 Let us know what’s wrong with this preview of Evanescent by Carlyle Labuschagne. Within my blood runs a thing our kind calls the Shadowing Disease. It shadows over, and bends everything to its will. When the first blood- shift came, it tore through flesh and blood, threatening to bend me, break bone, shatter my mind and entrap my heart with its honeyed, seduct Her fall has just begun. Only his touch can save her from the shift that could destroy it all. To ask other readers questions about Evanescent, please sign up. This won’t be my usual lengthy review, but it doesn’t have to be one in order to convey how I’ve felt about this series so far. Sometimes, less is more. I adored The Broken Destiny, which is book one in the Broken Series, but I do believe that Evanescent surpassed it. The author has grown in leaps and bounds, not that it really surprised me. Her debut novel alone was beyond what I’d expected. With Evanescent, though, I’d find myself on numerous occasions re-reading th ARC received from the author. I adored The Broken Destiny, which is book one in the Broken Series, but I do believe that Evanescent surpassed it. The author has grown in leaps and bounds, not that it really surprised me. Her debut novel alone was beyond what I’d expected. With Evanescent, though, I’d find myself on numerous occasions re-reading the same passage over and over; it’s how beautifully descriptive they were. The action in Evanescent was upped ten-fold and was such that whilst reading, it played in my head like a movie. I’d give anything to see this series on the big screen, it’s that good for me. I’ve read a handful of sci-fi/dystopian novels in my lifetime―probably sad but nevertheless true―and Ms. Labuschagne is by far occupying top position where I’m concerned. I live for the moments when I’m reading and a story makes me react physically to what’s taking place. Whether it’s anger, excitement, laughter or tears, makes no difference. Any emotion a book can evoke within me is a book I’ll remember forever. These are such books. This installment continues with not only Ava, Troy, Enoch and every other character we came to know and love―and I do love them all, even the evil―but it’s deeply rooted within the psyche of one particular character. I can’t really say much as I’d be giving not only the concept but the story away, and that would be unfair. An added bonus is reading from Troy’s and Maya’s POV, which gives us that much more insight into who they really are. Evanescent is fast-paced, riddled with suspense, has fabulous action scenes, tender and swoon-worthy moments and by the end, you are left wanting more. Good thing there will be a third on the way, and I for one simply cannot wait. This is Ms. Labuschagne’s second full length novel, and as far as I’m concerned she’s headed for good things. Some people were born to write. It’s written in their stars. To say I loved or adored Evanescent would be putting it mildly, but I did, and yet it was so much more. Ok were do I begin? With broken we learned a little about Ava and the darkness she held in her blood. she was a strong girl never fully believing that the life she was living was her own. She just knew that the council had been manipulating her and everyone on Posiden. She never gave up hope that she was meant for something much bigger. Her mothers journals proved that but she couldn't quite grasp there meaning. All she knew to be true were her feelings for Troy. Ava made huge mistakes and for t Ok were do I begin? With broken we learned a little about Ava and the darkness she held in her blood. she was a strong girl never fully believing that the life she was living was her own. She just knew that the council had been manipulating her and everyone on Posiden. She never gave up hope that she was meant for something much bigger. Her mothers journals proved that but she couldn't quite grasp there meaning. All she knew to be true were her feelings for Troy. Ava made huge mistakes and for that she will forever be regretful. Her actions caused havoc on Posiden and might have even started the prophecy she's been told about. This second book was just as full of life as the first. It still holds so many secrets I'm dying to know.. Troy is the biggest key to this story besides Ava. his part in the prophecy becomes more clear in this second book but is he strong enough to fight through the lies that are thrust at him. can he fight to see he trough and fulfill his destiny with Ava. I loved reading this even though at times I was a bit lost but I'm certain the third book will put an end to all my questions and there are a lot.. I just love this book. Could not put it down until I was done!!!! Ava and Troy are still my favors in this book but the new twist in this book about everyone is just mind blowing!!!! This is so a must read!!!! Forced to confront her dark destiny, Ava never once imagined what the repercussions of doing so would be. In her mind, she thought she'd retain a sense of who and what she is. That she'd get to make her own decisions when the time came. Sadly, nothing seems to be what she thought they'd be. Determined to overcome the disease that is now running rampant through her veins, Ava knows that her time is growing short. Her loved ones are in danger, and there's nothing she can do to stop what's coming th Forced to confront her dark destiny, Ava never once imagined what the repercussions of doing so would be. In her mind, she thought she'd retain a sense of who and what she is. That she'd get to make her own decisions when the time came. Sadly, nothing seems to be what she thought they'd be. Determined to overcome the disease that is now running rampant through her veins, Ava knows that her time is growing short. Her loved ones are in danger, and there's nothing she can do to stop what's coming their way. Though she's not sure as to how to control the darkness growing with her, she knows she has to try. Enoch must be stopped at all cost, and she's the key to doing just that. Recalling the rumors about her kind, Ava knows there's something within them that might help her overcome the Shadowing. Granted, she doesn't quite know what that something might be, but she'll do everything possible to uncover the secrets of her past. The knowledge she seeks is buried within her mind. She knows it. She just needs to get past her uncertainties to find what she needs to know. As the enemy's forces grows stronger, Ava comes to the realization that things aren't going the way she thought they would. The secrets she's uncovering don't make sense, making it harder to trust in herself and those around her. If she's to succeed in vanquishing the Shadow, once and for all, she'll need to come to terms with who and what she is. Only then, will she be able to seal the rift within and around her growing stronger by the day. A rift that may end up breaking her completely when all is said and done. I was given this book for an honest review! I am in love with this book! I mean really in love! I liked The Broken Destiny, but this masterpiece written by Carlyle was indeed an amazing, spellbinding experience to say the least. It's absolutely un-put-down-able!! It is difficult writing a good review without giving away spoilers, but this is a task I am willing to take. Everyone either quotes from the synopsis or the book itself, but that still doesn't even begin to describe the book. I was enthralled from the beginning! It picks up where the first one ended and page after page, it entices you like the Siren's call. It captures you like the shift and keeps you locked in a world where anything can happen, where love knows no boundaries, and truth doesn't always set you free. I feel sorry for Ava for what has happened to her, and for what will happen when she finds out about what Troy did...those that read the book would understand what I'm talking about. Oh and Troy...talk about heartthrob!! He has fought his way to the top of my list of book boyfriends, but I don't mind, he's great company! I did however get a little confused with the point of views. One moment you're reading in Ava's point of view and the next without warning, you are living Troy's or Maya's view. I didn't like that very much as it took me almost an entire page to realize who I was reading about. I am loving this series more and more with each new installment Carlyle Labuschagne has a way with words and draws you in from the beginning. They always say a sequel is never better than the first and I will admit I did not know if it could get better than Book 1 Broken Destiny, but Carlyle proved me wrong when I delved into Evanescent was was amazed at how much the characters grew in this installment. My mind is blown with this amazing writing. This series should be on everyone's TBR Pile. Filled with Action, Mystery and a few twist and turns you will not be able to put this book down. This book was a lot better then the first book and WOW what a TWISTS in the book! I loved every single twist I read! I believe that this one is my favorite so far! The story continued well and the cliffhanger at the end still has me stunned! I simply can not WAIT to see the next book! One tiny tip: I could not really figure out when the chapter was about someone else! One of my favorite part was finding out about the clone It was one of my favorite twists in this book! Oh and Troy.. if o This book was a lot better then the first book and WOW what a TWISTS in the book! I loved every single twist I read! I believe that this one is my favorite so far! The story continued well and the cliffhanger at the end still has me stunned! I simply can not WAIT to see the next book! One tiny tip: I could not really figure out when the chapter was about someone else! Troy I missed your sexiness, "you've been in there for awhile." He grinned at the sight of me in a towel. My hair dripped onto my shoulders and onto the floor." He's such a persistent thing, "yup, and you remember that I will always be there, even when you don't want me." And he'd still do anything for Ava, "to have you in my arms, safely - yes, I would," he said softly." I did like the book but at times it was confusing, and sometimes even hard to follow as I didn't know if sometimes it was ano Troy I missed your sexiness, "you've been in there for awhile." He grinned at the sight of me in a towel. My hair dripped onto my shoulders and onto the floor." He's such a persistent thing, "yup, and you remember that I will always be there, even when you don't want me." And he'd still do anything for Ava, "to have you in my arms, safely - yes, I would," he said softly." I did like the book but at times it was confusing, and sometimes even hard to follow as I didn't know if sometimes it was another characters point of view, or the same one. Then there was another thing I got confused on but I can't say what it is as it would be a spoiler. This is a riveting read! It's packed full of action as we discover some of the secrets to why Ava is what she is, and just why Troy is so important to her. There are twists and turns that leave you saying, "What?!" and Carlyle Labuschagne has thrown in loops and twists that I NEVER saw coming. She ties things together beautifully, yet she manages to leave me wanting more! Troy. That pretty much sums up everything about the romance in this novel. He's the perfect book boyfriend, and this book def This is a riveting read! It's packed full of action as we discover some of the secrets to why Ava is what she is, and just why Troy is so important to her. Troy. That pretty much sums up everything about the romance in this novel. He's the perfect book boyfriend, and this book definitely proves that! I've read The Broken Destiny, and when I saw Evanescent, book two of The Broken Series, I bought one to see what Carlyle did with the next part. I have to admit, I liked this one more than I did book One. It started with action, and carried on page after page with exciting plots and twists. There were times that I was completely bowled over by a twist I've never seen coming. Carlyle even gave us a couple of chapters through Troy's point of view and through Maya's. It was really a fun read and I I've read The Broken Destiny, and when I saw Evanescent, book two of The Broken Series, I bought one to see what Carlyle did with the next part. I have to admit, I liked this one more than I did book One. It started with action, and carried on page after page with exciting plots and twists. There were times that I was completely bowled over by a twist I've never seen coming. Carlyle even gave us a couple of chapters through Troy's point of view and through Maya's. It was really a fun read and I would recommend this to everyone that likes Dystophian Fantasy. Good luck with your novel Carlyle, and I wish you all the best. I enjoyed book one a little more than this one to be honest. I did enjoy the twist in the book which made it very interesting and kept me reading until the end. I was honestly a little confused by this "blood shift" because I felt I didn't understand what it was and couldn't remember reading it from the first novel... so perhaps I need to read novel 1 again. Love the imagery and love the local bits and bobs that's weaved into the story. I love this series Ava and Troy are amazing and i cant wait to find out what happens next. There are so many emotions i felt reading this one. All i can say is if u like sci fi romance and suspense then u need to get this one its really good and well thought out i am now a huge fan and cant wait for the journey to continue. i will be eagerly and somewhat impatiently awaiting book 3. I have say I think book was just freaking amazing!!!! I so love all the charters and in this second book they all are so amazing!!! This is a book well take you on an adventure to differ places that are amazing and dark. There are races fight a war for the life and love!!! This is a must read!!!!! 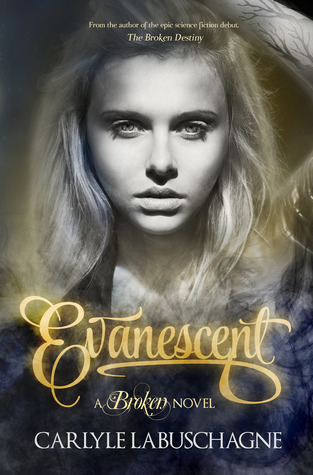 Evanescent is the thrilling and fast paced second book in The Broken Ones series. Ava learns about who she is and makes a few shocking discoveries along the way. It's perfectly written and just what I was craving from a good dystopian/ sci fi novel. I'm addicted and need more now! I preferred this book to The Broken Destiny as there is a lot more action and some things are revealed. Ava is a great main protag. Carlyle is a USA Today Bestselling, international bestselling and international award winning Sough African author - with a flair and passion for mixing genres , adding loads of drama to every story she creates. You are sure to lose yourself in the detailed words she dreams up. Carlyle has traveled the world with her books in hopes of connecting with all kinds of book loving people, to learn as much as she can from other book cultures with the hopes of bringing the knowledge back to her home country. For now she is happy to take over the world and convert non Sci-fi believers. Carlyle uses writing as a healing tool and that is why she has started her very own writers support event - SAIR bookfestival. "To be a helping hand for those who strive to become full times writers, editors, bloggers, readers and cover artists - its a crazy world out there you don't have to go it alone!"